Work with local print media ad representatives to place these full-color ads in community magazines and newspapers. Email Rotary's marketing team with success stories and questions. Who are the people/projects featured in the campaign? The first ads in the campaign feature real Rotarians in Colorado and Brazil, and the stories shown were inspired by actual projects. More stories from Rotarians will be featured in upcoming ads. Can clubs or districts modify campaign materials with pictures of their own projects? Yes. Guidelines are provided at Rotary.org/brandcenter to help districts and clubs localize the campaign with photos of their own communities. Is there guidance for taking photos for the ads? Yes. Rotary.org/brandcenter has a checklist and information on how to capture photos that focus on connections and community. Inspire your community in any language by posting one of these social media graphics along with an update about the work your club is doing locally. On Facebook, you can boost posts by ZIP code for less than $100 and substantially increase the number of people you reach. Campaign placement tips are on Rotary.org/brandcenter. There are also other ways to use the materials – consider adding campaign graphics to club and district websites, posting them on social media, and displaying the ads at events. What kind of support will be provided to members who don’t know how to buy ads or secure donated space? RI provides guidelines on how to develop media plans, buy ads, and secure donated ad space at Rotary.org/brandcenter. In addition, the RI marketing communications team will host a series of webinars to help club and district leaders with media planning. How does the campaign work with the existing Rotary brand positioning of “Join Leaders,” “Share Ideas,” and “Take Action”? 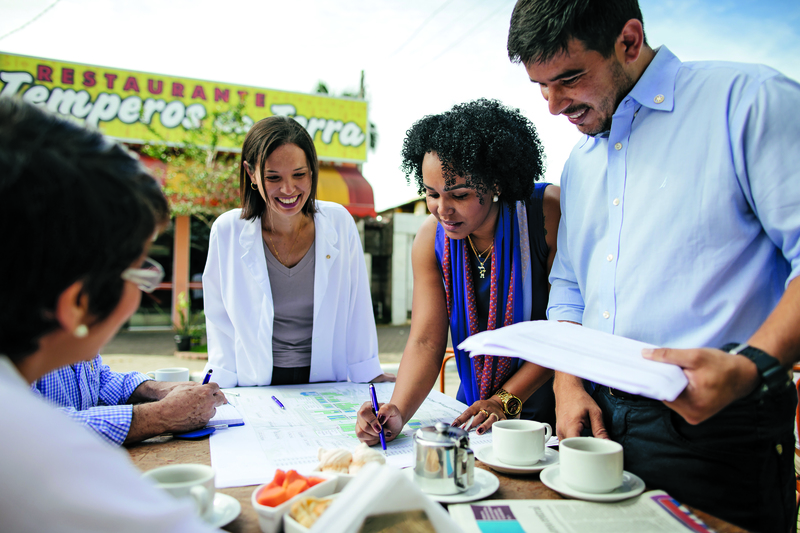 The People of Action campaign brings the Rotary brand to life by highlighting what happens when community leaders within Rotary join together, share their vision, exchange ideas about solutions, and then take action to make it a reality. Who do I contact with questions about this campaign? Please send all questions regarding the People of Action campaign to pr@rotary.org. Rotary's billboard ads will be available later this year. For guidance on how to buy billboard space, visit the Brand Center.